Sharing the road in the Tampa area isn’t always easy, especially when the other vehicles on the road are semi trucks. 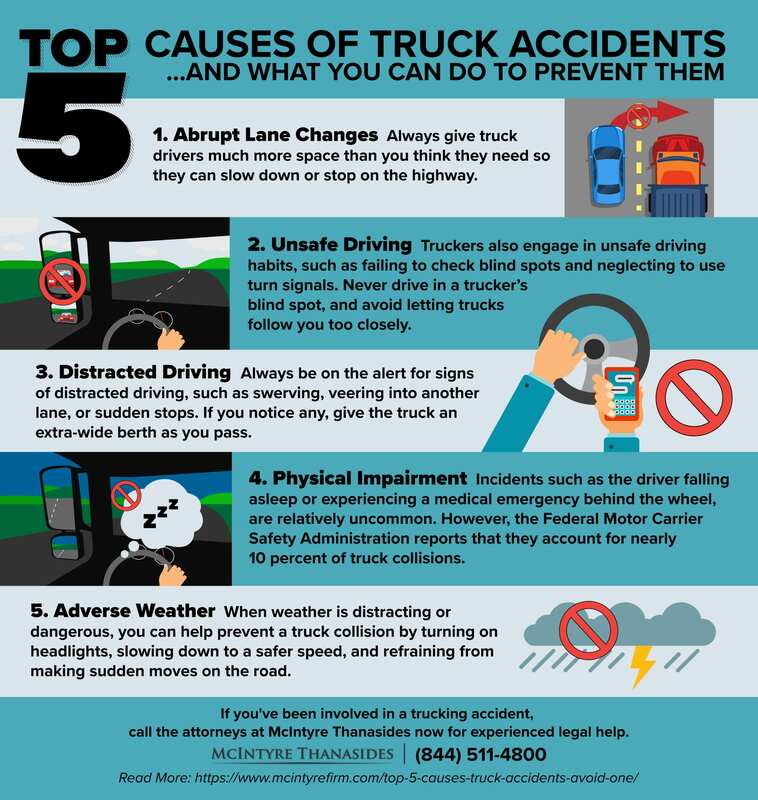 Before you get behind the wheel, discover the top five causes of truck accidents and learn how you can avoid them while staying safe on the road. While it’s easy to blame truck drivers for incidents on the road, vehicle drivers cause their fair share of collisions, especially when they change lanes or pass semi trucks abruptly. To avoid a collision, always give truck drivers much more space than you think they need so they can slow down or stop on the highway. Truckers also engage in unsafe driving habits, such as failing to check blind spots and neglecting to use turn signals. In fact, poor decision-making is one of the most common reasons for truck crashes. While you can’t predict whether a truck driver will flip on the turn signal before changing lanes, you can protect yourself just in case. Never drive in a trucker’s blind spot, and avoid letting trucks follow you too closely. Truck drivers put in hour after hour on the highway, and though regulations prevent them from texting or otherwise distracting themselves, these incidents still happen from time to time. When you approach a semi truck on the highway, be on the alert for signs of distracted driving, such as swerving, veering into another lane, or sudden stops. If you notice any, give the truck an extra-wide berth as you pass. Incidents of physical impairment, such as the driver falling asleep or experiencing a medical emergency behind the wheel, are relatively uncommon. However, the Federal Motor Carrier Safety Administration reports that they account for nearly 10 percent of truck collisions. Always stay alert when driving near semi trucks, and don’t hesitate to call the trucking company in question to report suspicious behavior. You can usually find contact information printed on the rear of the vehicle. The weather can change in an instant in the Tampa area, with bright sunshine one minute and torrential rain the next. Whether you’re driving on an open highway or a road that’s under construction, adverse weather can be distracting and dangerous. Avoid a truck collision by turning on headlights, slowing down to a safer speed, and refraining from making sudden moves on the road. If you’ve been involved in a truck collision in the Tampa area, don’t wait to get the legal assistance you need during the claims process. Call McIntyre Thanasides for experienced legal help: 844-511-4800. TJ Grimaldi is a Tampa Personal Injury Attorney concentrating on wrongful death, criminal defense and DUI cases. TJ has been featured in multiple national publications including Good Morning America; Nightline; The View; The New York Times; The Tampa Bay Times; and DailyMail.com.